Excision is probably the oddest movie that I've seen so far this month. It's a weird sort of mash-up of teen comedy and horror that sort of works, but also sort of doesn't. AnnaLynne McCord, cast expertly against type, stars as Pauline, an oddball teen misfit who doesn't really care if she pisses off the popular kids and doesn't really mind what they say to her in return. She's chastised at all times by her puritanical mother (Traci Lords, in a brilliant casting joke - also watch out for John Waters), mostly ignored by her wet blanket father (Roger Bart) and affectionately teased by her sister, Grace (Ariel Winter), who also happens to have cystic fibrosis. The cast elsewhere is excellent too; Marlee Matlin, Ray Wise and Malcolm McDowell pop up as staff at Pauline's school. Pauline is possibly one of the weirdest teenage girls committed to film with her lanky hair, bad posture and even worse skin. She's the very antithesis of the usual magazine-perfect teens that McCord can usually be found playing. Unlike other teen misfits, Pauline is never given a chance for a beauty makeover and rejects any attempts to change her at all. Instead, she happily flies in the face of convention and social etiquette. She also happens to have particularly bloody masturbatory fantasies that usually involve a corpse or surgical operation. These scenes are stylishly shot, cutting into Pauline's day-to-day existence and offering the film's audience a glimpse into her psyche. Excision's gleeful skewering of teen movie conventions gives it a darkly comic edge, one that serves the film well in its opening half. The traditional gawky girl gets to be with the hot guy plot is wonderfully subverted in one of the most matter-of-fact propositions you will ever see on screen. The act itself between Pauline and popular guy Adam (Jeremy Sumpter, formerly Peter Pan) is similarly clinical; Pauline knows exactly what she wants to get from the experience and acts and orders Adam around accordingly. There's a wry sense of humour here that helps offset some of the film's weirder moments. However, as the second half of the film continues and Pauline begins to unravel even further, the macabre sense of humour takes a backseat and becomes more horrific as the film develops. The shift in tone doesn't wholly work, though the film continues to exude a confidence that is rare in directorial debuts (director Richard Bates Jr also wrote the screenplay). Once you slowly realise what Pauline intends to do to win her parents' approval, everything becomes that bit less amusing, even when the film is still seemingly wanting you to laugh. It's an awkward move, but it doesn't detract from the power of the ending, which is surprisingly even more horrifying than you expect it to be. I seem to have developed a running theme of anti-heroines throughout this month's viewing, not something I had intended whilst choosing the films to watch. 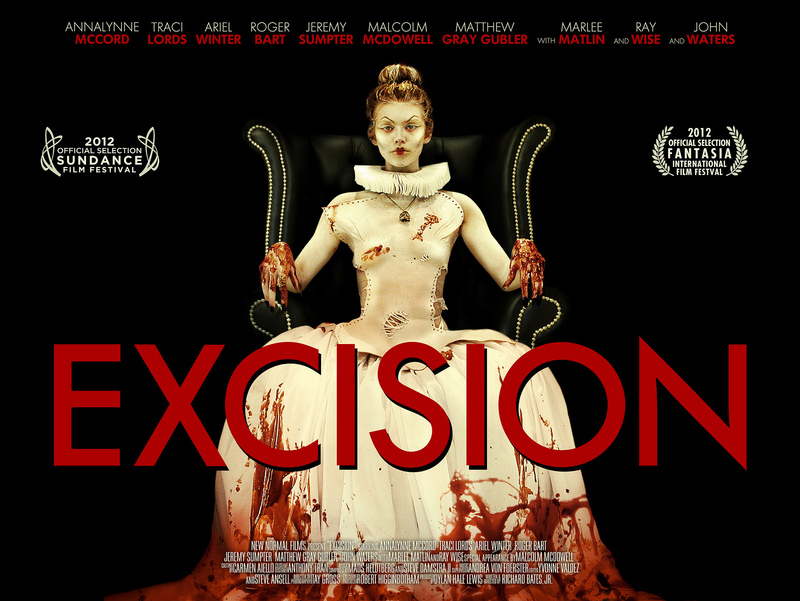 Films like American Mary, Teeth and now Excision all explore this idea of a female lead who, through circumstances both in and out of their control, decide to take a more violent route to get what they want. Pauline may take this to heartbreaking extremes, but it's fascinating to see a recent trend emerging of female horror characters who aren't just there to get naked or get slaughtered. There are a few other characters out there who fit a similar pattern, but the whole idea of the monstrous feminine is being played with a lot at the moment and producing some really interesting results. I'm still not entirely sure what to make of Excision, but I can't deny that it's a storming central performance from AnnaLynne McCord and a real gut punch of an ending. There's just something a little off about it that I can't quite put my finger on yet; another watch may be required.